Anything with cheese in it always puts a smile on my face! 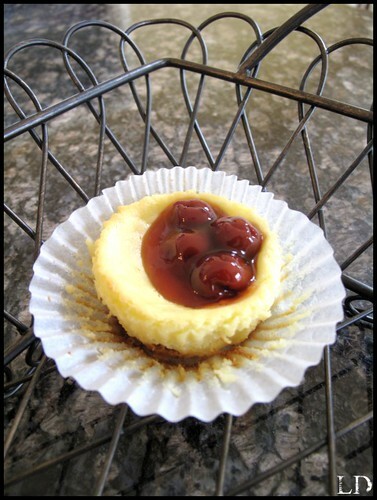 I remember when I was little my mom making these yummy little cheesecake tarts for church functions, picnics, and family gatherings. They are so simple to make and always disappear fast. Blend cream cheese, vanilla, eggs, lemon juice, sugar, mix until fluffy. Place a vanilla wafer into the bottom of a cupcake paper in a muffin tin. Then fill each cup 2/3 full with cheese filling. Bake at 375˙ for 15 minutes. Chill and top with cherry pie filling.